Thoughts always come from the core of the hearts so let them engraved on Valentine gifts so that your partner can understand the depth of your true love. If love can be defined in words then the thoughtful mugs are the best way to do so. So, give Valentine mugs on Valentine’s day and make your partner feel truly loved. Valentine's day is around the corner and you have to do lots of preparations such as planning a wonderful evening, planning to make your loved ones feel surprised, preparing delicious foods for them, and so forth. But, the most important thing which plays a vital role in celebrating this special day is gifts. Yes, you can't forget buying special Valentine gifts for your special someone. If you are looking for one of the best Valentine gifts for him or her, then you must think about Valentine's day mugs. It is one of the most admirable gifts for the one you love because through the Valentine mugs you can convey your messages very easily. It is also one of the best ways of expressing your hidden love for your crush. So, if you wanna propose your crush or want to offer a marriage proposal to someone you love, these special mugs will definitely help you in every aspect. On the special occasion of Valentine's day impress your partner by sending the most adorable Valentine gifts anywhere in India. It will do all the tricks and make your partner fall in love with you madly. Are you looking for the best Valentine gift for your girlfriend? If so, order Valentine mugs online and make her feel surprised. A personalized or photo mug is one of the best Valentine gifts for her, it will make her feel special. So, if you want to make her feel surprised, then place your order with FlowerAura. It is one of the best online gifting portals in your city which provides you with varieties of gift items for any special occasion. Here you will get the plethora of coffee mugs such as personalized mugs, photo mugs, heart-shaped mugs, printed mugs, and so on. FlowerAura is a name that you can trust the most because we promise you never let you down. Valentine's day is a day to show your feelings for your loved ones by giving them a love token such as flowers, bouquets, chocolates, cakes, and so on. So, if you are also looking for the best Valentine gift for your near and dear ones, then go for something personalized. Because giving a personalized gift item to your loved ones make them feel extra special. The thoughtful gifts show that you think about them. And, of course, it is also very important to let them know your true feelings for them. 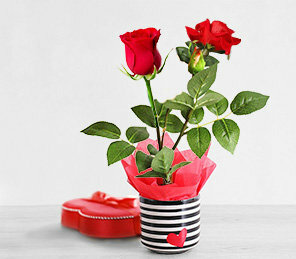 So, gift personalized Valentine mugs to your loved ones on the special occasion of love. The best thing about gifting Valentine mugs is that you can make them personalized by engraving your favorite quotations or love messages over them. Photos of your dear ones can also be engraved over a coffee mug which will give it an awesome look too. Valentine's day is all about celebrating love and spending some special moments with your partner. It is a day for which everyone waits from a long time. But, it is not possible all the time that you get a chance to spend this special day with your partner. In that case, you can send your love to your loved ones by sending lovable Valentine gifts to them. You can make them feel your presence by sending gifts. So, if you are also staying away from your dear ones, then FlowerAura provides you with the opportunity to send a beautiful love mug to your partner across India so that you can express your feelings for them without any hassle. Hurry up! Browse our website and place your order now. We are 24 hours available for you so that you cannot miss any chance to express your love and emotions for your near and dear ones. So, send personalized Valentine mugs to your loved ones on the special occasion of Valentine's day so that they can feel your true love.